Content Marketing World is one of the largest, if not the largest, content marketing conferences in the world. Robert Rose and the team at CMI and UBM do an amazing job of putting on this show each year in Cleveland. Getting the most out of the show requires some advance preparation. For first-timers (and forgetful repeat attendees), here are a few suggestions to enhance your CMW experience. 1. Stay hydrated. While Cleveland is in relatively temperate Ohio, the Huntington Convention Center is still desert-like inside due to air conditioning. You won’t notice you’re dehydrated because you’ll think it’s nice and cool. Drink water copiously. As the US Army expression goes, if you don’t have to use the restroom frequently, you haven’t had enough water. Consider bringing or buying a reusable water bottle on site. 2. Bring COMFORTABLE SHOES. You will be walking a TON. See this picture? This is the Huntington Convention Center. Though deceptive from the surface, inside is 140,000 square feet of conference space. Walking to and from sessions, hotels, the works – you’ll be putting a lot of strain on your feet. 3. Bring a portable power strip and power banks. Outlets aren’t always nearby and you will burn down your phone battery being social. I’m partial to the Anker 20,000 maH power brick. It weighs as much as a small brick but will keep a tablet and smartphone charged all day. I also carry a Tessan power strip, which I love. It’s a friend-maker – bring it out and make friends. 5. Plan your sessions in advance. Got that burning question handy? Install the app! 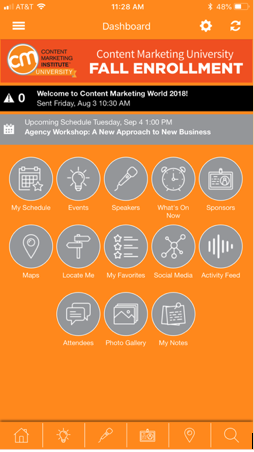 Use the event planner to start and be sure to add key sessions to your calendar using the handy add to calendar feature. 7. Bring earplugs. I always travel with ballistic earplugs. They’re great for reducing that screaming baby on the airplane to a dull roar, and priceless for major events like CMW. Loud convention centers and concerts and parties are awesome… for a short while. Enough loud noise will tire you out. Bring a bottle of earplugs and you will end up much less fatigued. If you plan to attend any of the major parties or go out to eat at the local restaurants, you’ll want earplugs in your kit. 8. Bring business cards. Lots of business cards. CMW will host upwards of 4,000 physical attendees this year. 11. Bring healthcare preventative measures. As stated above, CMW attracts upwards of 4,000 physical attendees who eat together, stay in the hotels, party together, shake hands, and share the same air, water, and physical proximity. Bring hand sanitizer packs, wash your hands frequently, and consider purchasing an NIOSH-approved N99 face mask, especially if you’re arriving by airplane or other form of mass transit. Consult your physician/qualified medical practitioner about taking a multivitamin and/or other immune-boosting supplements. 12. Participate in pre-show activities. Content Marketing World offers great pre-event activities like Twitter chats and networking in the app, which gives people a chance to meet, ask questions, and discuss favorite topics well in advance of the show. By the time we all arrive in Cleveland, we’ll have our tribe. #1. Yes, bring/buy a reusable water bottle. #CMWorld is going green this year! #3. If you forget (or don’t want the extra weight of a power strip), get to sessions early enough for a seat near the front. They usually have power. #9. I always bring a tote bag that folds up and fits in an outside suitcase pocket to carry home books, t-shirts, swag, etc. #11. Counter Attack is the best immune booster I’ve ever, ever used. Already hoarding for cold/flu season! #12. Couldn’t agree more—don’t be shy. #CMWorld attendees are the best, friendliest, most generous people you could ever meet. – Don’t wait till you’re packing for the return flight to look through the sponsors and swag bag. Make a list and make a point to visit the ones that are relevant to you. Plus, a lot of sponsors have prize drawings… stop by and drop your card! – Bring a sweater or other stuffable long sleeves for chilly conference rooms. And a small lightweight, travel umbrella. – I also like to bring a bag of almonds or other healthy-ish snack. There’s food everywhere, but it tends to be carb-heavy and/or sweet. Disclosure: All links to Amazon in this post are affiliate links. Trust Insights earn a small but non-zero fee if you buy something.